Landscape professionals’ preferred choice for recycling with the option of bagging. The Toro® Recycler 21″ (53 cm) mowers deliver rugged, dependable performance and productivity that professionals can rely on. These heavy duty walk power mowers are available with a choice of premium features to suit every need. Industry’s Thickest Deck: The .3″ (6 mm) thick die cast aluminium deck is manufactured to withstand the abuse of commercial mowing while minimising overall mower weight. Crankshaft: Features a hearty 1″ (25 mm) diameter crankshaft, plus a steel crankshaft guard that further protects against unexpected impacts. Steel Wheels: Low maintenance and highly durable steel wheels utilise sealed ball bearings and steel pivot arms for long life with less downtime and lower replacement costs. Designed for Commercial use: Both models come with a long range fuel tank which saves time on re-fuelling and a replaceable oil filter. 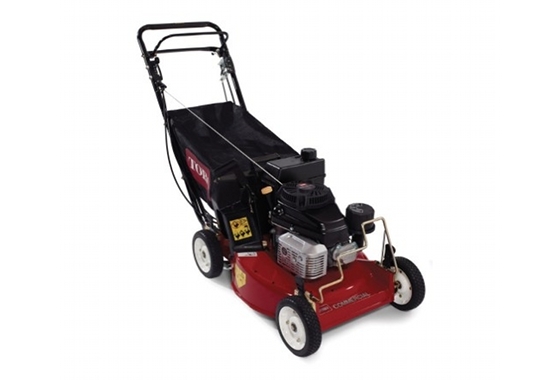 Variable 3-speed Gearbox: Heavy duty 3-speed gearbox propelling the mower at 2.3 and 3.8mph.